Our representative will receive you at the airport. Proceed to the hotel for an overnight stay. Enjoy a guided tour of the capital city of India. Visit famous places of Delhi including India Gate, Laxmi Narayan Temple, Parliament House, Jama Masjid, Humayun's Tomb, Red Fort and Gandhi Memorial. Return to the Delhi hotel for a night stay. After an early breakfast travel to the airport for your flight to Leh. On arrival in Leh you will be transferred to the hotel for an overnight stay. Spend the fourth day of the Great Himalayan Wonder Trekking Tour by going for a guided tour of Leh. 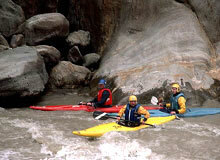 The sightseeing tour will cover major attractions of the city like Shey, Spituk, Thiksey and Hemis Gompas. Overnight stay in Leh. Visit the Alchi Monastery while driving to Kargil in the morning. Check into the hotel at Kargil for an overnight stay. Early morning you will be driven to Padum. It is a 9-hour drive that takes you through he Zanskar Valley. On arrival, check into the hotel for a night stay. The day will be spent on a 7-hour trek to Mune where you will spend the night in a camp. On the ninth day of Himalayan Trekking Tour of Tours to Himachal Pradesh, you will be trekking to Dortzon that takes about 7 hours. Enjoy an overnight camp stay in Dortzon. Trekking from Dortzon to Purne takes 6 hours and gives you a glimpse of the beauty of the Himalayas. Overnight stay at the camp in Purne. Enjoy an excursion trek to Phuktal where you will spend the night in a camp. After an enjoyable 6-hour trek you will arrive in Thable. Proceed to the camp for the night. After a leisure morning trek to Gomborajan that takes about 4 hours. On arrival, reach the camp for an overnight stay. The scenic beauty of the Himalayan region can be enjoyed during the 6-hour trek to Lakong. You will stay overnight at the camp in Lakong. Arrive at the camp in Chuminakpo after an 8-hour trek. Enjoy the overnight camp stay at Chuminakpo. The popular trek to Zanskar Sumdo takes about 7 hours and leaves you tired. Stay overnight at the camp. The magnificent beauty of the Himalayas leaves you spellbound on your 4-hour trek to Palamu. Spend the night at Palamu camp. It takes a whole day to reach Darcha. The route that has to be taken for trekking is exciting and challenging. Rest and recharge your batteries upon arrival for an overnight stay in the camp. You will pass the renowned Rohtang Pass on your morning drive to Manali. Proceed to your hotel for an overnight stay in Manali. Spend this day at your leisure. Explore the city, rest in your hotel room or go for shopping. Return to the hotel in the evening for a night stay. You will be taken on a sightseeing tour of Manali on the twenty-first day of the Great Himalayan Wonder Trekking Tour in Himalayas. The guided tour includes visits to Rohtang Pass and Vasishth Hot Springs. Enjoy an overnight stay in Manali hotel. After a leisure breakfast, drive to Nalagarh. This heritage site is known for its immense beauty as well as for offering unparalleled views of the Himalayas. You will be driven to Delhi in the morning. On arrival in Delhi, check into the hotel for an overnight stay. After a relaxed and lavish breakfast you will be transferred to the airport for your flight back home. India Profile offers bookings and excellent packages for golf tours in India and tours to Himachal Pradesh. To book a tour, or further queries, please fill up the form given.